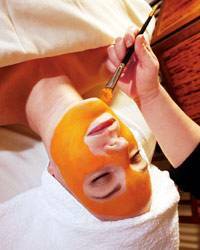 We are proud to offer DermaQuest’s latest aesthetic phenomenon – The Pumpkin Revival Peel! A results oriented treatment. Safe for all skin types. Using PURE Vitamin A.
Refines and smooths skin texture. Visible reduction in pore size. Softens, plumps and hydrates skin. Leaves skin Radiant and Glowing. Evens skin tone and brightens even the dullest of complexion. 40% Pumpkin pulp with pure Vitamin A to remove dead skin. Helps stimulate collagen production and reduce unsightly lines. Note: If this is your first time receiving a skin care service at SB Massage and Spa, please arrive 10 minutes early to complete any required forms.